Jim Mann has cited health problems among his reasons for standing down as Kilmarnock chairman days after the first anniversary of his appointment. The businessman took over from Michael Johnston at last year's annual meeting of the Scottish Premiership club. "I am now 69 and have suffered some health issues in recent months," Mann pointed out in a club statement. As he lives in Milton Keynes, he said remaining chairman of Kilmarnock had become "unsustainable". He added it had become difficult to combine the role with his business and other interests. "There is no reason other than that for my decision to stand down and I hope that the club's shareholders and supporters will give their full support to the board of directors as it embarks upon the process of appointing a new chairman while steering the club away from relegation," he said. "It is with considerable regret that I have to announce my decision to stand down as chairman of Kilmarnock Football Club at the forthcoming annual general meeting. I will also retire as a director from that date." Mann, who lived in Kilmarnock until 1972, was a senior executive with TUK Travel plc until his retirement shortly before taking over as chairman at Rugby Park. Shortly after Mann took over, Gary Locke was made permanent manager having had a spell as caretaker, but the former Kilmarnock midfielder resigned in January with his side sitting second bottom of the table. The Ayrshire side are in the same position despite the appointment of Lee Clark as Locke's successor and it was not until Saturday that they recorded their first victory under the new boss, at the seventh attempt - a 3-0 defeat of St Johnstone. 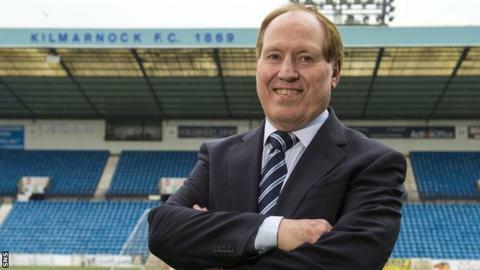 "Having been born and bred in Kilmarnock but having spent most of my career working in England, it was a dream come true to be appointed chairman of the club I have supported throughout my life in March 2015," Mann added. "So this has not been an easy decision for me to reach, particularly at this difficult stage of the season with the club in a precarious league position. "I wish Lee Clark, his backroom staff and the players the best of luck in the weeks ahead. "Everyone at the club is fully focused on the task at hand and determined to succeed. "I have enjoyed working with the club's directors and staff, from all of whom I have received full support and unstinting loyalty. I leave the club in good hands."